A handful of members of the Saskatchewan Craft Council spent last week in blizzardy Toronto at the annual Toronto Gift Fair (TGF). The gift fair enables retail outlets from across the country to meet suppliers of wholesale product. The artists we took to TGF were Wendy Parsons, Devon Dietrich, and Zach Dietrich of Parsons Dietrich Pottery, Rhonda Lamb of The Fibre Bin, and Gwen Fehr of Joan’s Beeswax Candles. 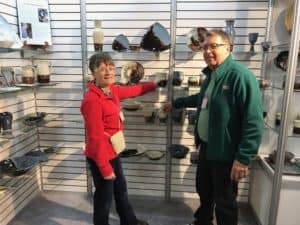 Parsons Dietrich Pottery from Moose Jaw have been participating in our program for the past six years, with sales growing steadily each year. 2019 was no different. Nothing is sold from the floor at the TGF — only orders are taken. Now that these artists have returned home, the work to create and fill the orders begins.